Quick hack for spell check with AvalonEdit. As the name of the article implies, this is a quick hack to add spell check in your application using the brilliant AvalonEdit. This is a quick tricky/dirty way to implement spell check using the built-in spell checker in .NET without relying on 3rd party libraries. Note that this might not be the most efficient way of spell check. AvalonEdit is a popular open source text editor control used in #D and widely used by many open source developers in their open source projects. When I started using AvalonEdit, I wanted to add spell check in my application. Initially, I was under the assumption that AvalonEdit inherits from TextBoxBase which means that I can just use the inbuilt spell checker. However that is not the case - AvalonEdit inherits from Control. Every AvalonEdit text editor control has a corresponding TextBox control exclusively to get spelling errors. Every change to the text editor will also update the text box - thereby letting the application get the spelling errors. 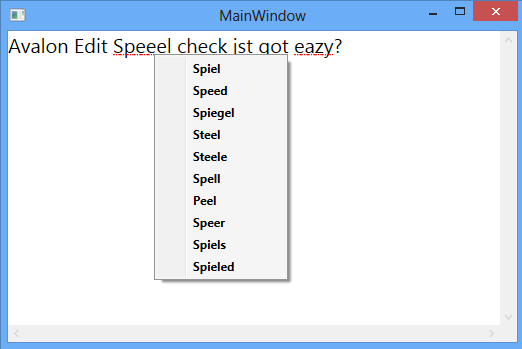 This has been implemented by creating a behavior called SpellCheckBehavior for AvalonEdit. A new DocumentColorizingTransformer called the SpellingErrorColorizer, is available as a part of the code. This needs to be added to the list of line transformers in the text view of your editor. The idea behind this transformer is using a static text box which can give the errors on the DocumentLine that needs to be processed. Download the code and have a look at it as it is self explanatory. In MainWindow.xaml, create an instance of the text editor and add the behavior. In MainWindow.xaml.cs, add the SpellingErrorColorizer to the line transformers. Note: In this implementation, I did not care about the performance. If you have a better suggestions, please share/contribute. 03/11/13 - First spell check idea. Hello! I'm a 26 year old, WPF/C# self-learned software developer, musician from India with a Master's degree in Computer science. I believe that every piece of software and information/knowledge is available for free for those who seek it. My projects are available in my Webpage hosted on Github. I am eager to learn new things everyday, explore new technologies and solve problems. Is MSWord on machine is needed where this application will run? How the word library will be enhanced? Re: Is MSWord on machine is needed where this application will run? Not sure - I think the dictionary which is being used here is based on the WPF TextBox and not based on MS Word. I tried to download the source code but it does not seem to work - I get an error message about a ticket not being provided (possibly an error in the error system). I tried a different article and it works fine. I'll check back later. Can you check now? Looks like the new link is up.